I discovered this article last year and thought it very fitting to share today. Poppies have infact popped up on a steep bank on our property. People stop and comment on how striking they look against the greenery. Papaver rhoeas, also known as the common poppy, corn poppy and red weed, among other names, is considered a nuisance plant by European farmers and often grows in areas where the soil has been disturbed. In the warm spring months beginning in 1915, with World War I in full swing, across many of the shell-blasted, trench-strewn battlefields in Belgium, France, as well as in Turkey, poppy seeds (which can lie dormant for more than 80 years) began to germinate in the newly turned earth, and poppy flowers were soon dotting the war-ravaged landscape, including the front lines where John McCrae, surgeon for the First Brigade of the Canadian Field Artillery, was stationed. In May 1915, McCrae was tending the wounded in the trenches near Ypres, Belgium. He noticed the bright red poppies that had begun to bloom between the many simple graves of soldiers, including near the spot where one of his best friends had recently been buried. 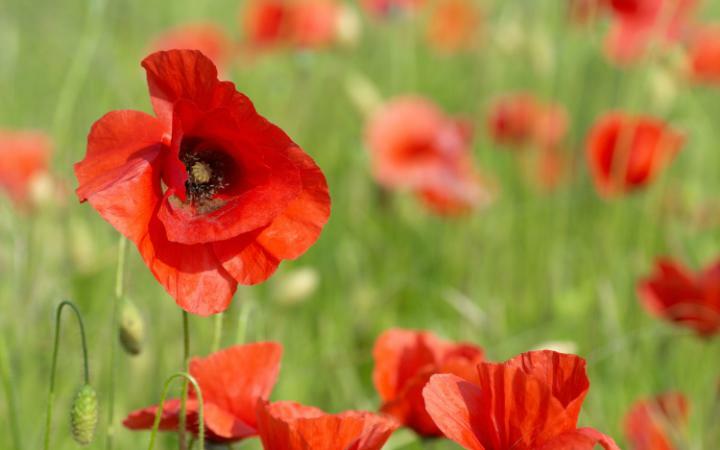 The scene inspired him to write a poem, “In Flanders Fields,” which begins: “In Flanders fields the poppies blow, Between the crosses, row on row.” It would soon become the most famous poem about the war. Three years later, in November 1918, Moina Belle Michael, a professor at the University of Georgia, came across McCrae’s poem, which both inspired her to write a poem of her own on a similar theme and to begin to wear an artificial silk poppy on Memorial Day (originally called Decoration Day and specifically associated with the American Civil War) as a way to honor those who had died while serving in the military. She also sold the silk flowers to her friends and coworkers to raise money for soldiers in need. Eventually, the tradition spread. By the 1920s, the Veterans of Foreign Wars of the United States, a national service organization for military veterans, began to distribute silk poppies on Memorial Day as a way to help provide disabled vets with some financial assistance, and the flower became forever linked with the holiday. The common poppy also plays a role in Remembrance Day, observed in many Commonwealth countries on November 11 to coincide with the end of hostilities in World War I, and Anzac Day in Australia, New Zealand and Canada, among other countries, which is observed on April 25 as a day of remembrance for the war dead in those nations. Nice story of the poppy.